The points of contact between Rutgers Cooperative Extension Service and the grower & business communities are the NJ County Agricultural Agents. The agents are a tremendous source of information for both new and experienced growers. Visit your local county extension office. 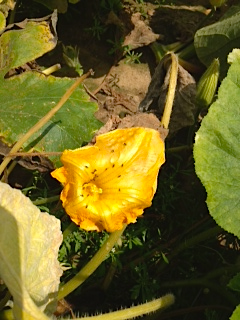 For the past 3 years, I have had growers complain about seeing gnats in pumpkin flowers this time of year. In each case, they do not seem to be causing any damage to the plants or healthy fruit. Rather, they are a nuisance in the field, especially for PYO pumpkin patches. Most gnats are short lived. However, the major problem with gnats is they reproduce quickly, with eggs hatching 3-5 days after they are laid. They seem to congregate in open flowers and rotted fruit. Most likely they are feeding on the nectar inside flowers and are using the rotted fruit as a medium for laying eggs and as a food source for larvae. They should be killed by frost, however, pumpkin patches will also most likely be done when frost occurs. Recently, an organic grower with a variety of squash crops under low tunnels called Ag Agent Meredith Melendez about wilting plant symptoms. The various vine and bush varieties were decimated by squash vine borer (SVB) larvae root damage. Ornamental gourds were especially hard hit. Last week Meredith Melendez, Mercer County Ag Agent, fielded this question from a grower who currently runs a CSA and is considering adding PYO (pick-your-own) fruit to the farm's portfolio. Rutgers Cooperative Extension Agents, including the Agritourism Team, weigh in with specific answers and solid advice. 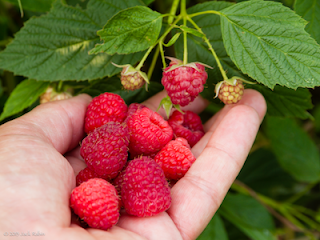 They offer small-fruit crop suggestions, discuss the special problems related to organic cultivation of these crops, and comment on how agritourism activities can add to the farm's bottom-line. 1. Drinking enough water to replace body fluids lost through sweating before, during and after work. 2. Gradually adjusing to working in the heat. 3. Taking periodic rest breaks in shaded or cooler areas whenever possible. 4. Careful monitoring of enviornmental conditions and worker health by supervisors. Train workers to recognize, prevent and treat heat illness is important. Workers should take precautions like: getting enough rest, wear protective clothing, drink extra water, adjust work schedules if necessary. *Fatigue, *Nausea, *Muscle Aches, Weakness and Cramps, *Headaches, *Confusion or Anxiety, *Dizziness, *Fainting, *Drenching Sweats Accompanied by Clammy and Cool Skin and *Slowed or Weakened Heartbeat. 1. Get the person out of the sun and heat and into a cool shady or air-conditioned area quickly. 2. Lay the person down with legs and feet elevated slightly. 3. Loosen or remove clothing. 4. Have the person drink cool water, sports drinks or other non-caffienated beverages. 5. Use a spray bottle or cool wet sponge/cloth to apply to the persons body and fan them. This will create evaporative cooling. 6. Monitor the person since heat exhaustion can quickly become heat stroke. Alcohol, drug or other substance abuse will increase the risk of heat illness. Improving personal health will help prevent heat stress. 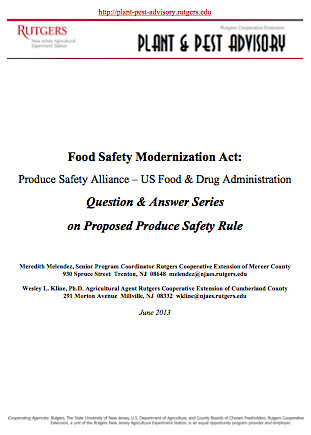 Over the past weeks, we have posted the Questions and Answers for each of the conference calls focusing on subparts of the proposed Produce Safety Rule of the Food Safety Modernization Act on the Plant and Pest Advisory Food Safety section. For your convenience, the Q&A's have been collected into a single PDF. Penn State Extension is offering a new online Retail Farm Market Employee Professional Development session to build the knowledge and confidence of your farm market personnel that handle, process, or merchandise fresh market produce. More details can be found here. ©2011-2013 Rutgers, The State University of New Jersey. All rights reserved. Simple theme. Powered by Blogger.